Spray is a derogatory term for a monologue wherein an individual describes his or her climbing in an arrogant, narcissistic and self-promoting manner. Those who engage in spray are usually trying to elevate themselves and their egos above whomever they are talking to. In other words, spray isn't just bragging, it's a form of put-down. The subtext to spray is that, "I'm so good, you could never dream to be as good as me..."
GUY: "So you guys are going to climb this route, huh?" US: "Yep. Looks pretty cool." GUY: "Yeah, it reminds me of this sick 5.14 crack climb I FA'd up in the valley." GUY: "Yeah, the FA on this route here is by John Long." US: "Yep, we read that... in the guidebook." GUY: "Yeah, I was out climbing some stuff at a new area with him last summer. We put up some sick hard lines." 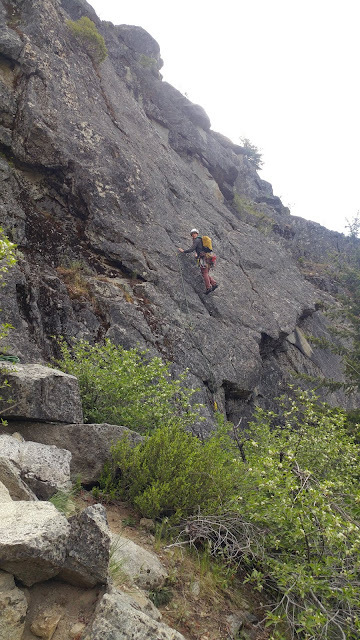 This guy continued to spray like a firehose until we finished our climb and left. Kind of pathetic, really. I had a similar encounter a few years ago. We were climbing at The Gallery in Red Rock Canyon when a guy approached a group adjacent to us. The guy was simply looking for a little bit of information, but the sport climber he approached was far more interested in derogatory spray. The guy asked a simple question, "hey man, is this a good route?" The sport climber looked at him like a he was a piece of dirt and then spoke with an indistinguishable accent, "for you, zis is a good climb." He smiled, "but for me, maybe I do zis climb when I am sick or I am tired. But for you, zis is a good climb." In three short sentences, this expert sprayer had not only proclaimed his skill, but completely and maliciously put down the person who asked him a question. Years later, I still jokingly imitate the man's spray...which is easy to do when it was so pronounced and vicious. Needless to say, spraying is poor etiquette. --A climber was killed while descending Mt. Stuart on Sunday. 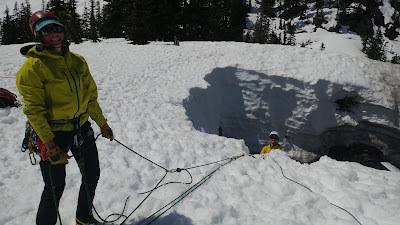 It appears that the individual slipped while descending the Cascadian Couloir. To read more, click here. --An injured climber was airlifted off Mt. Borah in Idaho this week. To read more, click here. --Two stranded climbers were rescued off Forbidden Peak last week. It's not clear why they were rescued or what lead to the operation. To read more, click here. 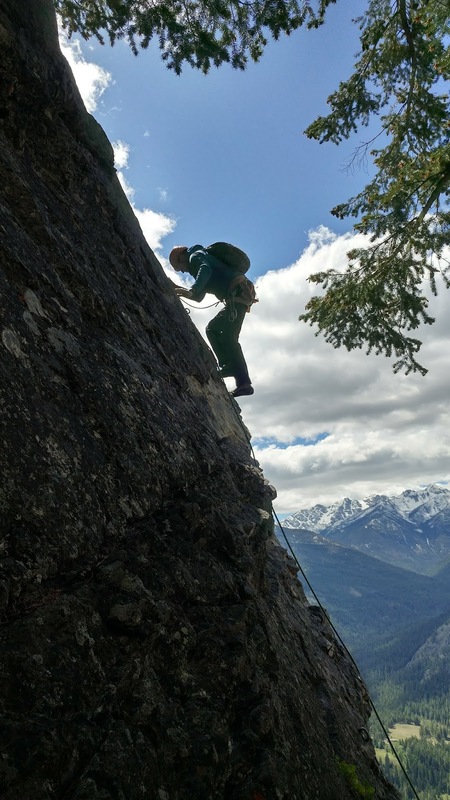 --Q13 Fox is reporting that, "The National Park Service said Tuesday it plans this summer to begin relocating hundreds of mountain goats from Olympic National Park to the North Cascades while killing others. The agency said it finalized a plan to remove about 625 mountain goats that have long posed an ecological problem in the park. 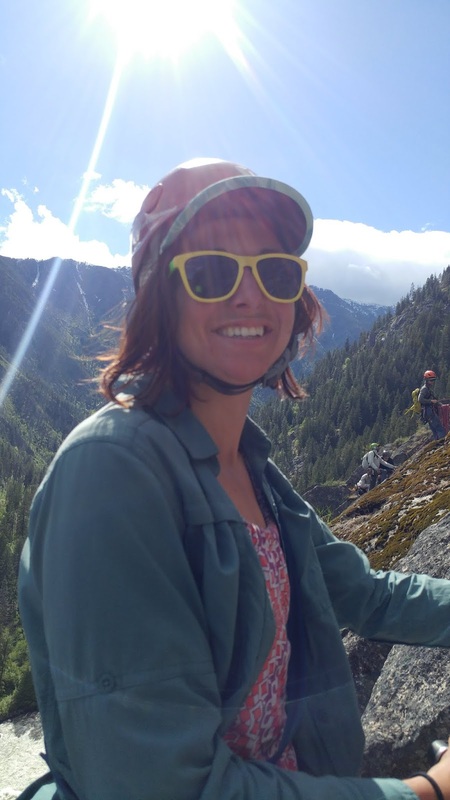 The fatal goring of a hiker by a goat in 2010 raised new concerns about public safety." To read more, click here. 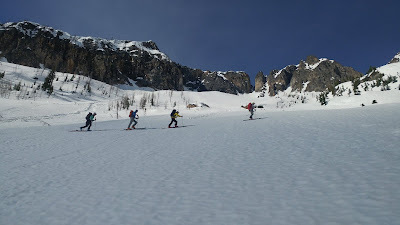 --Several speed records have gone down in Yosemite Valley in the last two months. 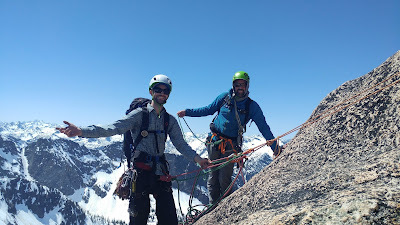 Alpinist is reporting that, "Brandon Adams and Roger Putnam climbed the Shield in 8 hours, 55 minutes; Josie McKee and Diana Wendt established a female record on the Salathe, climbing the route in 16:24 on June 1; David Allfrey set the solo record of 10:52:50 on Zodiac on June 2; and and Alexa Flower, Jane Jackson and Gena Wood completed the fastest all-female ascent of Zodiac in 16:20 on June 15." To read more, click here. --A fire burned approximately 91 acres of Red Rock Canyon National Conservation Area last week in the Pine Creek area. To read more, click here. --Out There Colorado is reporting that, "A jury ruled in favor of a Colorado ski resort company, saying it was not at fault in the death of a 13-year-old boy." To read more, click here. --The 2019 World Cup Ice Climbing Competition will be in Denver. To read more, click here. 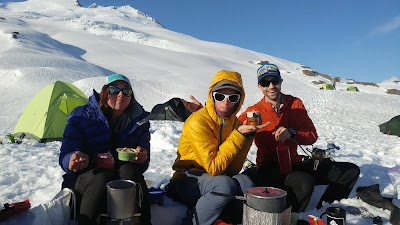 --AAI's final Denali program, Trip 7, has moved to high camp. They hope to make a summit bid in the coming days. To read more, click here. --The Anchorage Daily News is reporting that, "A climber who fell more than 100 feet in a remote mountain range in Lake Clark National Park was flown to an Anchorage hospital in critical condition early Sunday after a risky, dramatic rescue by an Alaska Air National Guard crew." To read more, click here. 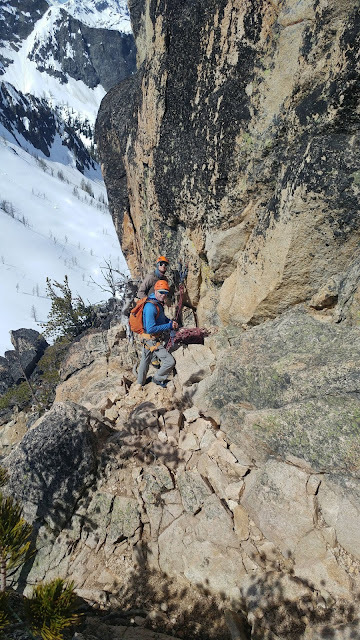 --The San Francisco Chronicle is reporting that, National park rangers in western Wyoming have recovered the body of a climber who fell to his death. 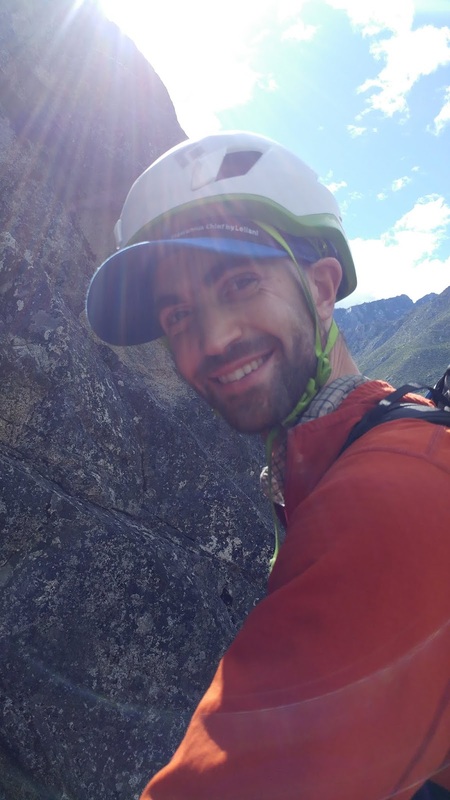 Grand Teton National Park officials say they believe 27-year-old Burak Akil of Wayne, New Jersey, was climbing alone Sunday on Teewinot Mountain." To read more, click here. Climbing etiquette is a weird and wiley thing. What is acceptable in one area may not be considered acceptable in another. What is common practice in one spot, may be looked upon with horror in another. 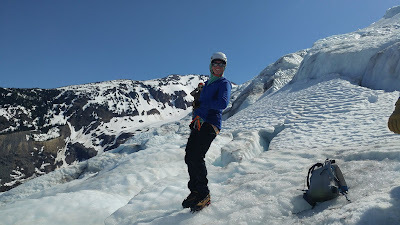 In the larger climbing world, there are millions of etiquette questions, but on a glacier there only tends to be a few. 1) What is the etiquette for passing a rope team on a glaciated climb? It is acceptable to pass a rope team on a glacier. However, this must be done without hindering the other team's progress that you're passing. If a team has a pace and continues to hold that pace, then they have a right to the boot-pack trail no matter how fast they're moving. In order to pass the slower team, the faster team must step out of the boot-pack and pass the other team without slowing them in any way. This may take considerable energy if the snow outside the boot-pack is soft or deep. The passing team should not complain about having to pass as they didn't get up as early as the slower team. If your rope team is walking in a boot-pack and needs to take a break, the polite thing to do is to step out of the trail. You should not take a break in a place that blocks others. If your team is slow and is taking a lot of standing mini-breaks (i.e. 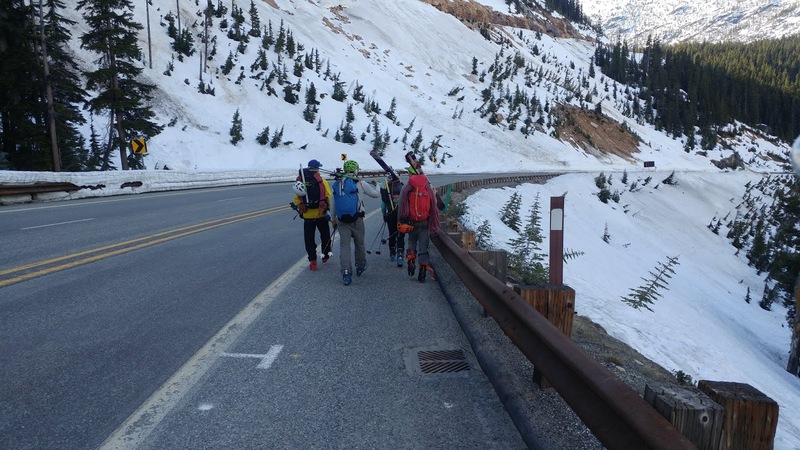 stopping for a few seconds or even a minute or so), then you should step out of the boot-pack and allow faster teams to pass in the trail without protest. 2) Who has the right to the steps that have been kicked in the slope? There is a nice line of steps kicked into the slope going all the way up the mountain. Clearly, it is easier to use the steps that another team has put in than to create your own. As you're climbing up the mountain, you see another team descending in the steps. Their plunge-steps are completely destroying the steps as they descend. And while this may make things more difficult for your team, you didn't create the steps and as such, don't have any ownership over them. If you create a series of steps up the mountain, you do have the right to use them on your descent. However, it is far more polite to leave these steps for others. I will almost universally try to leave my steps for other climbers, unless the snow is incredibly soft and difficult to move through. Occasionally, the snow is so deep that new downhill steps could cause a climber to hyper-extend his or her knee. When conditions are this severe, I use my uphill steps for downhill travel. 3) What should I do with my human waste? Should I leave it on the summit for all to see with a nice pile of toilet paper? Or should I do something else with it? You should do something else with it. On expeditions or on big mountains, sometimes you can put your waste in a crevasse, but you should pack out your toilet paper. On smaller glaciated peaks, you should use a Wag Bag or the equivalent and pack everything out. On mountains like Mt. Baker and Mt. Rainier, all waste should always go out with you. 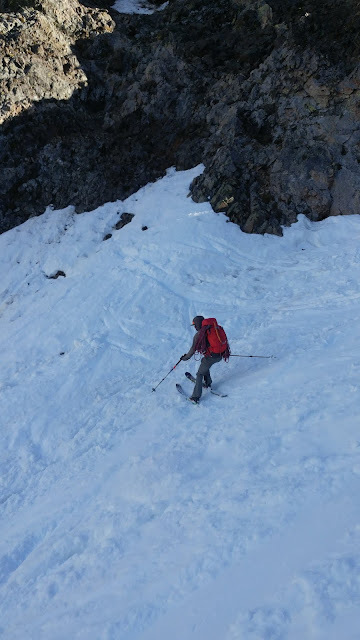 If you are incapable of doing this, then you shouldn't be in the mountains. If you have other etiquette questions, feel free to post them. This is such a large topic that a single Blog cannot do it justice. We all have them. They are the luxury items that you absolutely must have on every trip. In climbing, we always worry about weight. Every single item that we carry costs us energy, so every single item that we carry should be valuable to us. I am terrified of tent time. I am terrified of knowing how many stitches are in my tent because I don't have anything but counting them to occupy my time. And as you know, sometimes the weather causes us to be trapped in a tent for anything from a few hours to a few days. As a result there are two items that I will always have with me. First, a book and second, a jetboil or reactor with lots of tea. Books can be heavy, but they are literally worth their weight in gold when there is a storm. If you are in the middle of a novel, don't be afraid to cut a book in half in order to avoid carrying some of the weight. I often slice books in half and then put duct tape on the remaining spine to ensure that it doesn't fall apart. At the ripe old age of 44, I've become lazy. I do not want to get out of my tent at the middle of the night to use the bathroom...indeed, I don't want to get out of my sleeping bag. As such, I carry a pee bottle on most of my mountaineering trips. Men have it a little bit easier with pee bottles than women do. If men get really good at using them, they don't have to get out of their sleeping bags. Women usually require a pee funnel (something that most female guides consider an indispensable). The reality is, that I find a pee bottle so indispensable to my happiness on trips, that I would use one at home if my wife would let me. She doesn't...and has threatened divorce if I even think of trying to use a pee bottle in bed. Early in the season I like to bring down booties. These provide a great way to get out of your boots when it's snowy. Later in the season, when I can camp on dry dirt, I like to bring a pair of flip flops for the same reason. These items provide my boots the opportunity to dry and my feet the opportunity to breathe. And lastly, I find good chocolate to be indispensable in the mountains. Why? For two reasons. First, it tastes really good and I have a sweet tooth. And second, eating fat before going to bed can help you keep warm at night. When your metabolism is at work breaking down fatty foods, it warms your body in the same manner as light exercise. It's hard to sleep while exercising, but not so hard when you're just digesting. 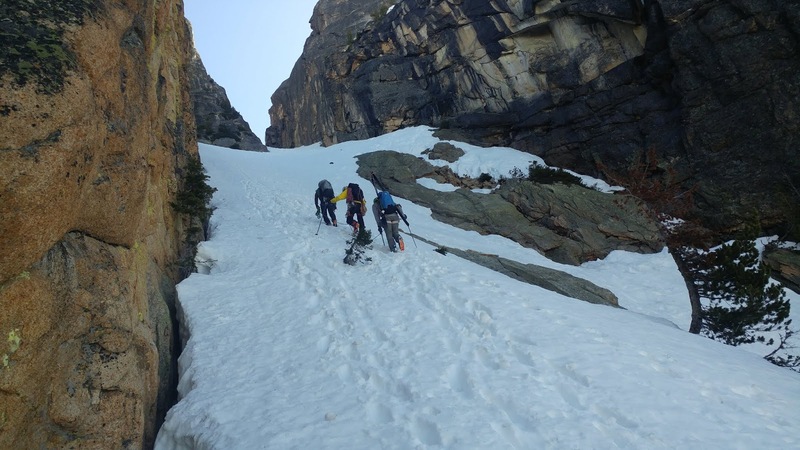 While I consider each of these items to be indispensable on multi-day mountaineering trips, I consider all of them to be completely dispensable on short, fast and light alpine climbing trips. On such trips, I carry as little as possible. And when I say as little as possible, I mean as little as possible. This may mean leaving everything from the toothbrush to the sleeping bag behind. In the world of climbing, it's not at all uncommon for one climber to be stronger and more experienced than his or her partner. 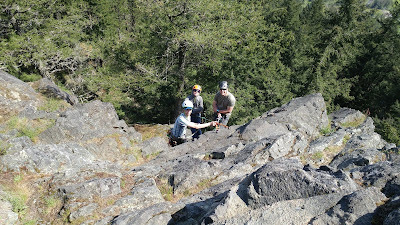 In such a situation, many climbers elect to move together on easier terrain. In some cases, teams with this kind of make-up even choose to simul-climb. If there is a significant difference in strength and skill level, then moving together and simul-climbing should probably be avoided. 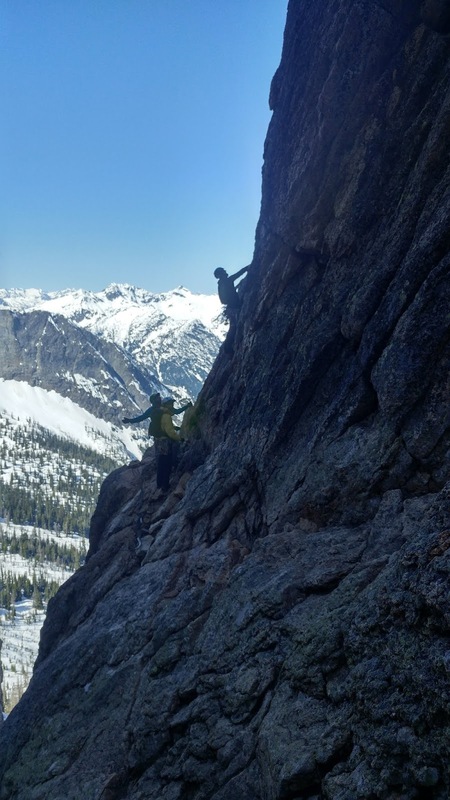 Instead of "simuling," the better option would be for the stronger climber to scramble up easier terrain in short 20 to 50 foot pitches and then situate himself in a good stance or seated position. Once he's stable, he could then employ a quick belay technique to bring up his partner. 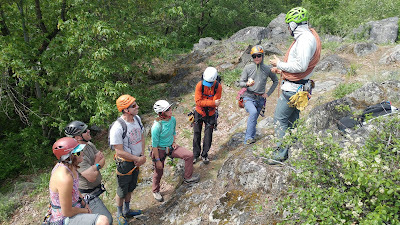 Before employing a belay technique, it is incredibly important that the climber is in a very solid stance or seated position. 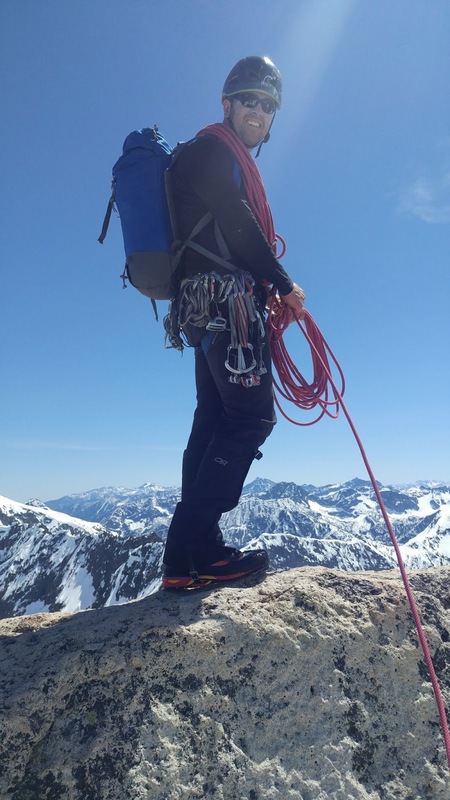 If the position isn't safe and there is the possibility that the climber could be pulled from his position, then he should place a piece of gear and clip into it. If that's not enough and there is still danger, then this is not a quick belay situation and a true SERENE/ERNEST anchor must be built. It should be obvious to everyone that a hand belay is very weak. 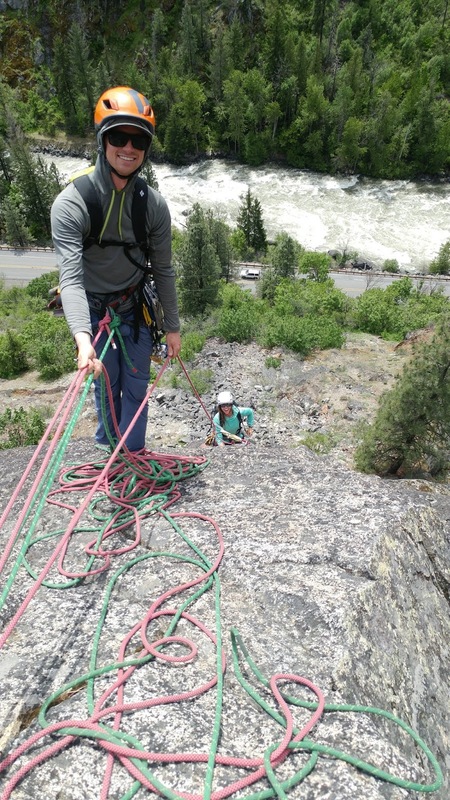 The hand belay should only be used to assist someone through an easy move. It should never really be thought of as something that could arrest a real fall and it should never be used to protect someone in a truly exposed area. That said, a simple hand belay can occasionally help a someone step up onto something tall or can create confidence in a climber as they step over an obstacle. A carabiner pinch is a simple and quick belay wherein a carabiner is clipped to your harness or an anchor. The rope goes from the climber through the carabiner and is then redirected back toward the climber. 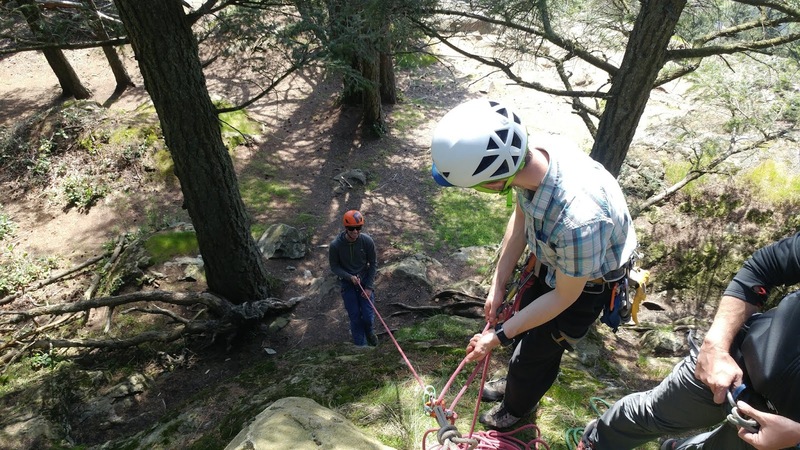 The belayer can simply pinch the rope on either side of the carabiner to create more friction. 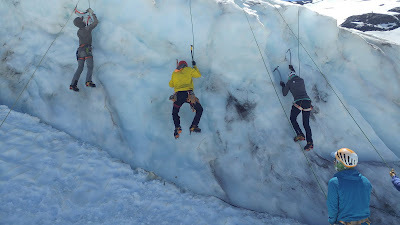 Clearly, this too is a very weak belay technique. As with a hand belay, this should only be used for minor assistance on terrain where there are little consequences to a fall. 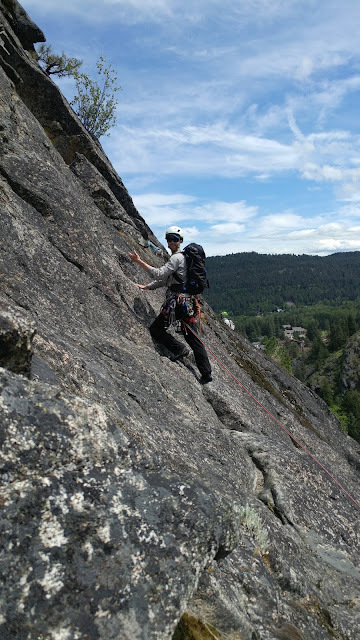 Though many guides use the carabiner pinch for quick and simple belays, I personally believe that it is just as effective to turn the carabiner pinch into a munter-hitch. Such an adjustment requires almost no additional time, but adds a great deal more security. A shoulder belay is a very quick body belay. In this technique, the belayer turns his body to the side so that his profile is facing the cliff. If his right shoulder is oriented toward the drop, then the rope from the climber will run up from the edge, through his right hand, across his back, over his shoulder and into his left hand. The belay will then look a lot like a hip belay, but from a standing position, over the shoulder. To make this technique work properly, the climber strand should be at approximately the same angle as the leg closest to the edge. Ideally, this strand parallels that leg. The biggest problem with this technique is that the center of gravity is really high. If the leg is not parallel with the strand going to the climber, it's easy to get pulled out of position. The hip belay is perhaps one of the oldest belay techniques and has been used effectively in a variety of circumstances. Due to it's limitations, however, most modern climbers only use this technique on terrain up to low fifth class. 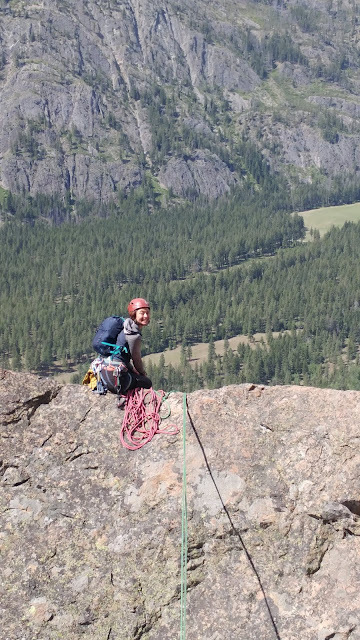 To implement a hip belay, the climber must first find a good seat. Ideally there will be some kind of feature to place one's feet on in order to create more stability. 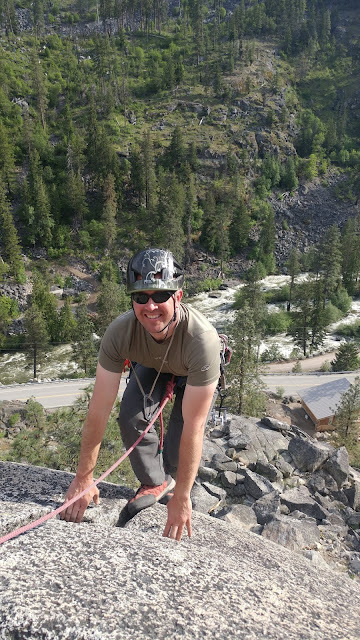 Once in position, the belayer puts a wrap of rope around his waist and then uses the "pull pinch slide" belay technique to bring in rope. 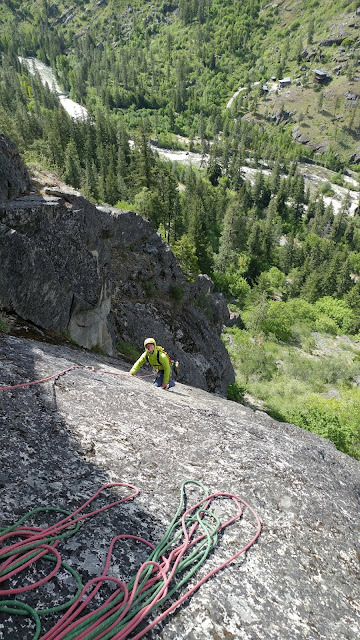 If the climber falls, then the belayer will wrap the rope more radically around his body. 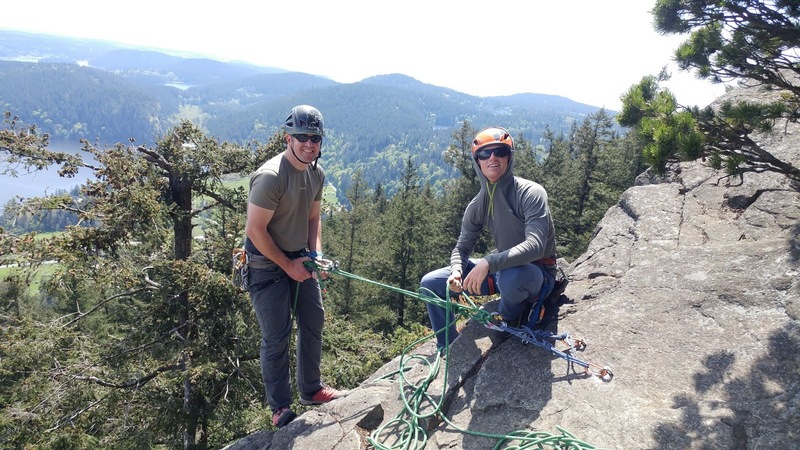 If the belay seat is not solid, the belayer may elect to put in a piece to back himself up. If he does this, then the piece should be on the same side as the end of the rope running to the climber. This will keep the belayer from getting twisted if the climber falls. And finally, Any anchor piece should be on the same side of the belayer's body as the climber strand. The following is a very good video on hip-belays from a snow seat. 1) AAI doesn't recommend the rope twist on the arm as shown in the video. 2) AAI recommends that one kick the heels of their feet into the snow in addition to the bucket. 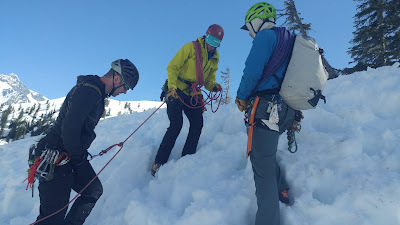 3) It's not ideal for one to belay a leader from a bucket/snow seat. 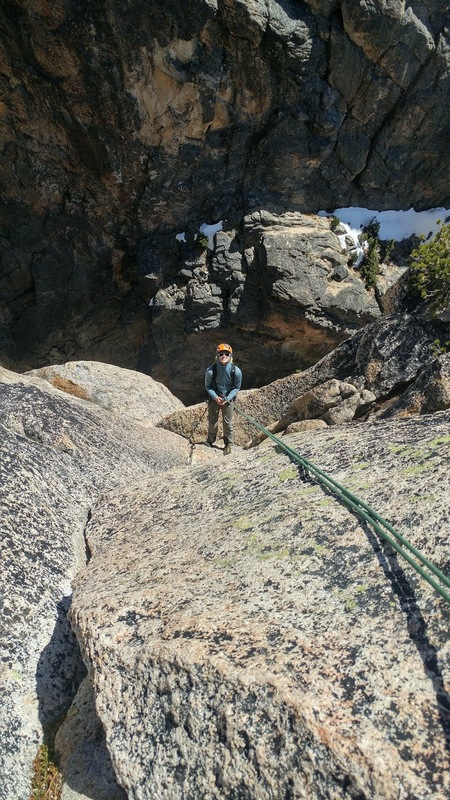 An extremely quick and effective technique is to place a carabiner on the belay loop and tie a munter-hitch into it. From a good stance or a seat, this is an incredibly useful means of creating a quick belay. The trick though, is to be able to build the munter-hitch in the carabiner. 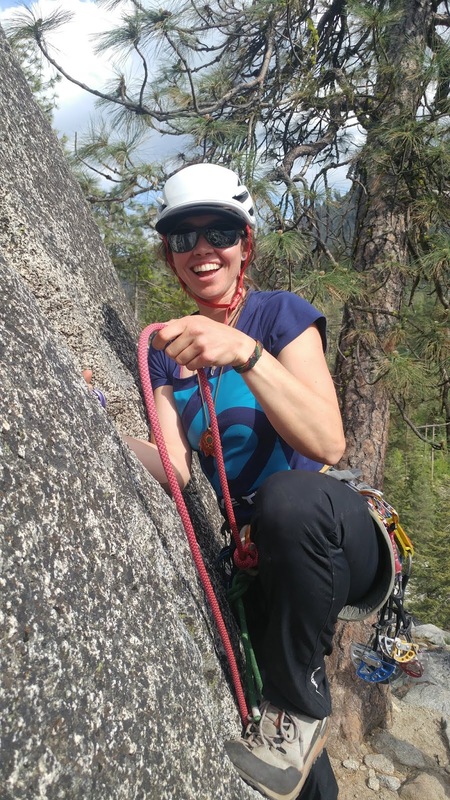 Once you are able to easily build a munter-hitch on a carabiner, this particular technique can be faster and more secure then either a shoulder belay or a hip belay. It can also be easier to get it into place due to the fact that backpacks often hinder the other body belay styles. 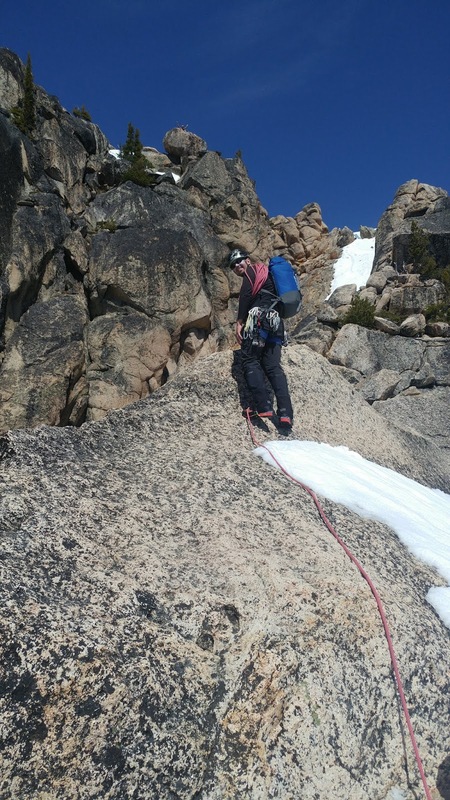 Quick belays are an incredibly important part of a climber's arsenal. However, they will really only be quick and effective with practice. Once each of these are dialed, then belaying a second on easier terrain becomes far more quick and efficient. The Pacific Crest Trail is a 2,660-mile trail that runs from Mexico to Canada. It's on many people's bucket lists, including my own. Unfortunately, I don't think I'll be able to do this until I retire. That said, we can all enjoy this short film where I guy took two seconds of video every day and spliced it all together. Positioning the belay to avoid a clash of bodies. Securing a leader who is resting on the rope. Arresting falls with a solid, yet "soft" catch, or stopping the leader cold if obstacles are in the fall line. Hoisting a fallen leader back to their high point as needed. This nine minute video is a must-watch for new belayers, as well as for those who have been belaying leaders for a long time. There is a tremendous amount of information within each chapter of the video. It was 1997 and I was on a backpacking trip with the woman who would one day become my wife. We set-up camp in the fog and then went to explore. We weren't on a glacier, we were just above tree-line on the Pacific Crest trail, and we couldn't see anything. We wandered around a little bit, just enough to get disoriented in the fog. There were lots of hints as to how we could have gone back to camp, but I wasn't paying attention. Instead it was my significant other who navigated us back. She had been watching land marks and paying attention. The mountains are tricky. And not paying attention is an easy way to get hurt, lost, or even killed. Obviously, you need to pay attention everywhere in the mountains, but here are a few thoughts about places where particular care needs to be taken. The preceding photo is of a debris field below Colfax Peak on Mt. Baker. The humps in the snow are ice blocks which sheered off an ice cliff above the glacier. The boot pack goes right through the center of this field. There are two things which bother me about this particular objective hazard area. The first is that it's easy to go around the icefall zone. But it's shorter to go through it. The result is that no matter how many guides try to move the boot-pack to the outside of the debris field, people continue to go right through it. The second is that climbers often don't look at where the debris came from, and they just sit down on the ice blocks to take a break or have a snack. There are icefalls all over the place that you have to go through. The danger is mitigated by moving fast, not by having lunch. 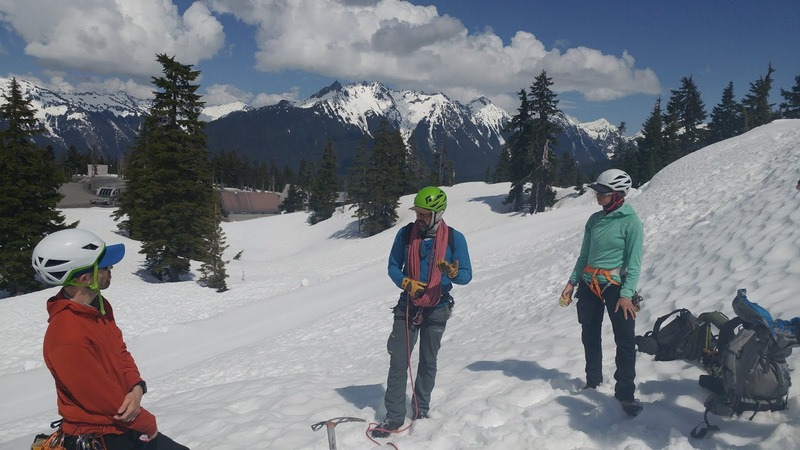 This second photo is also on Mount Baker on the summit plateau. You'll note that there are two boot-packs. One of these leads down the Coleman-Deming Route and the other leads down the Easton. It's incredibly common for people to get to the summit, turn around and to start walking down the wrong side of the mountain. And this happens on crystal clear days... Imagine what happens when there's a whiteout. Once again, this is a very simple thing. Pay attention to where you came from and it will be much easier to get back. Obviously, paying attention isn't the only thing you need to do in order to navigate well. You should also know how to use a map, compass, altimeter, GPS and guidebook. But paying attention is a good start. Baseline navigation in the mountains is simple. Look around. Take in your surroundings. Make sure there's no objective hazard above you. Make sure you know where you came from. All of this will help you to have a successful day in the mountains. --A Boy Scout group is lucky to be alive after a harrowing night on Mt. Baker. 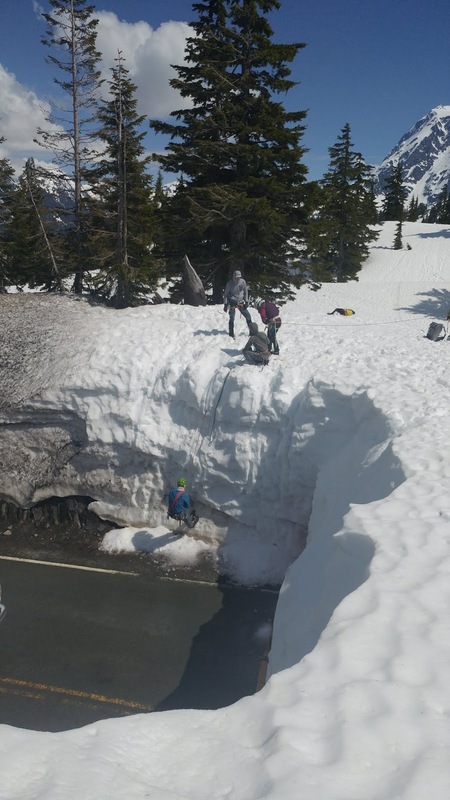 From the News Tribune: "Four members of a Boy Scouts climbing party were found safe about 9:30 a.m. Monday after a freezing night in a cave near the 10,781-foot summit of Mount Baker, officials said. A man, a woman and two 13-year-old Scouts were in serious condition with severe hypothermia Monday afternoon at PeaceHealth St. Joseph Medical Center, and were later transferred to another hospital out of the area, according to hospital spokeswoman Hilary Andrade." To read more, click here. --A new report indicates that the Mt. 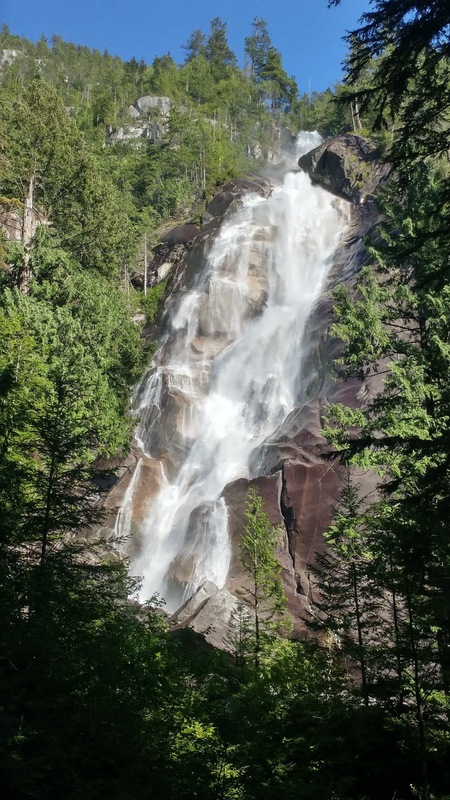 Baker-Snoqualmie National Forest is an economic powerhouse for the Pacific Northwest. As an asset it is worth nearly a trillion dollars. To read more, click here. --It appears that Vail Resorts is going to purchase Stevens Pass Ski Area. To read more, click here. --Climbing magazine is reporting that, "On the morning of June 2 at 8 a.m., while speed climbing on the lower pitches of the Salathé Wall on El Capitan—a section called Freeblast—two highly experienced climbers, Tim Klein and Jason Wells, were involved in a fatal accident. The team was simul-climbing through Pitch 9 or 10, 5.7 terrain approaching Mammoth Terraces, when the incident occurred. 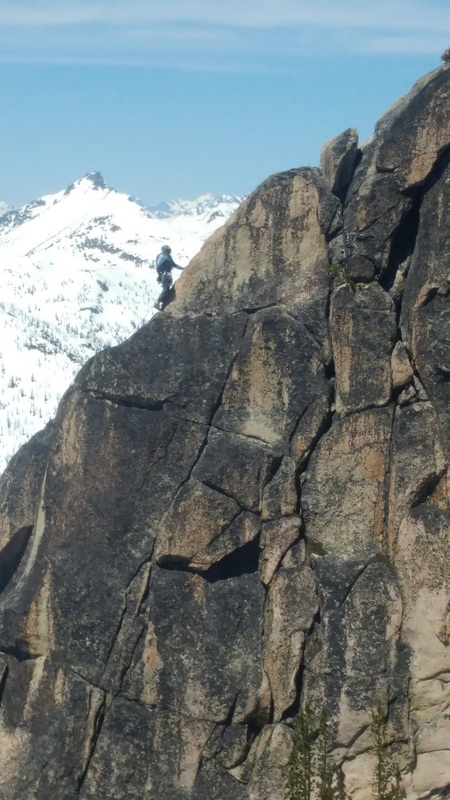 A scream was heard and both climbers fell, roped together, 1,000 feet to the ground." To read more, click here. --After the death of two climbers in Yosemite this week, Outside is asking whether speed climbing is too dangerous. To read the article, click here. --Speaking of speed climbing, Alex Honnold and Tommy Caldwell set a sub 2-hour speed record on the Nose yesterday. This is akin to breaking the 4-minute mile. To read more, click here. --Rock and Ice is reporting that, "On June 2, a hammerless David Allfrey sent his first solo El Cap route, the 1,800 foot Zodiac, casually logging a speed record in just under 11 hours. The previous solo record for the 16-pitch route, listed on speedclimb.com, was 11 hours 18 minutes by Nick Fowler, back in 2002." To read more, click here. --Vail Resorts is buying Crested Butte Ski Area. To read more, click here. 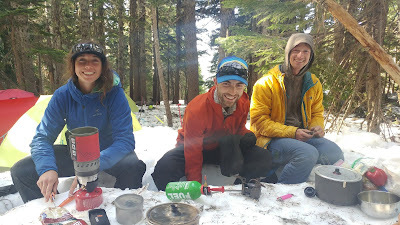 --Team 4 going went to High Camp yesterday, Team 3 made a summit attempt on Monday, and Team 6 made a cache at 10,000-feet on Monday. To read more about AAI's Alaska adventures, click here. --A 29-year-old woman was injured in a slide and crevasse fall this week on Denali. To read more, click here. --The Anchorage Daily News is reporting that, "A remote stretch of Alaska mountains across Cook Inlet from Anchorage has become the center of a court fight between a heli-skiing company and the Trump administration. The company, Tordrillo Mountain Lodge, is accusing federal land managers of jeopardizing clients' safety by issuing a permit to a competitor without proper review." To read more, click here. --High Country News is reporting that, "last year, about 330 million people visited the parks. That’s roughly 5 million more visits than the total U.S. population and almost 50 million more visits than in 2012. While visitation has increased, staffing levels have declined and the costs of overdue park infrastructure projects have ballooned to around $12 billion. As the national parks’ summer high season begins and the understaffed Park Service works to keep them clean and safe for the crowds, politicians are fighting over how to pay for the parks." To read more, click here. --Ummm... You'd think he'd know better with all the NPS is going through and sexual harassment. From the Washington Post: The top-ranking official at the National Park Service has apologized for behaving “in an inappropriate manner in a public hallway” in the wake of an inspector general’s investigation into an anonymous allegation that the official had made a gesture involving his genitalia in front of other employees. In a staff-wide email to Park Service employees on Friday, P. Daniel Smith wrote that as “a leader, I must hold myself to the highest standard of behavior in the workplace. I take my responsibility to create and maintain a respectful, collegial work environment very seriously. Moving forward, I promise to do better.” To read more, click here. The American Mountain Guides Association is continuing to put out some really good videos with Outdoor Research. In this video, AMGA Instructor Team Member, Olivia Race, demonstrates three different types of improvised rappels. This is the classic "Freedom of the Hills" style system that every climber engaging in multi-pitch climbing should be aware of. This is a much simpler concept. But it can result in some significant twists in the rope. This final system is a more modern variation of the first system listed here. It's important with each of these to ensure that nylon isn't rubbing nylon and that ropes are not running over gates. Netflix is known for some quality television programming. Many shows the network has produced have been good, and in some cases they've been great. Think Orange is the New Black, House of Cards, Stranger Things, Bloodline, Mindhunter, Black Mirror and on and on and on. Simultaneously, Netflix is also known for some real film flops. Think The Cloverfield Paradox, Bright, The Do-Over, The Ridiculous Six, and on and on and on. I personally can't imagine taking someone who is injured off trail through a forest, even if it looked to be a shorter distance. In real life, once the team realized that going straight through the forest means climbing over and under logs all day, it's likely they would have given up on that strategy. There are many problematic elements to The Ritual. 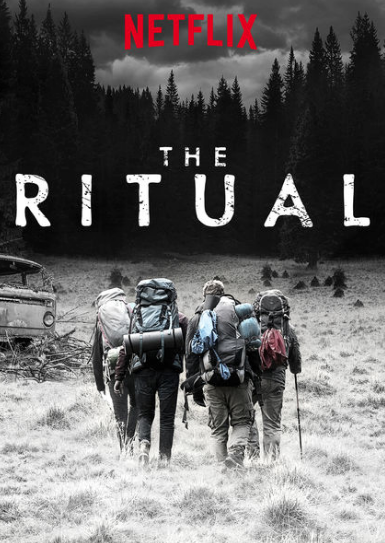 It's not always a good movie, but it's creepy enough, with just enough of a Blair Witch style feel to it to keep you engaged. For example, Luke -- the film's lead character played by Rafe Spall -- lost a friend to a burglar at a convenience store, while he hid safely behind a rack of chips. Luke is haunted by this. And the monster in the woods torments him with memories of the robbery. Indeed, there are some incredible sequences where Luke is half in the primeval forest with some kind of horrible beast nearby and half under the garish lights of the store, dealing with the loss of a friend by the hand of a different kind of beast. These splits in the character's reality are nightmarish and provide the viewer with a creeping sense of dread. It's unfortunate that the other characters aren't provided with a similar depth. We know they're also tormented by the monster. But we really don't know what their torments are. The story starts with a major screw-up. 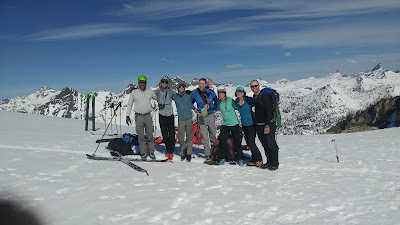 A team of amature backpackers don't have any type of communication equipment that works in the backcountry, so after a minor injury, they leave the trail. Some weird stuff happens at night after they're in the woods; you know, stuff like one guy waking up to find that he's naked, covered in blood and worshiping a statue of a straw elk-man hybrid. A bunch of weird things happen to other people too, but instead of retreating back to the trail (which they should have done), or even continuing to follow their compass bearing (which isn't as good as retracing their way back to the trail, but better than what they do), the team decides to follow the least rational member of the party down a faint trail deeper into the forest. In the real world of outdoor adventure, we call this the consistency or commitment heuristic. Sometimes we make a bad mistake and then just go with it until there's an accident. Sometimes when someone seems to know what they're doing -- or in this case someone seems super committed to one action -- the rest of the team follows that person, even when they know it's the wrong thing to do. I wish that filmmakers would put weight into prop backpacks, so that actors could feel what it's like to carry a pack. Instead, many movies that take place in the backcountry seem fake from the start. In this film, one character never buckled his waist belt. Another's pack rode so high that there was significant visible air between his shoulders and the straps. Actors in backcountry films are often supposed to look tired, but using packs full of newspapers or whatever is in there, makes them look goofy. It's worth noting that the monster -- when we finally see it in this movie -- is pretty cool. Indeed, it might be one of the cooler movie monsters to come out recently. I don't want to describe it in detail. It is actually well worth waiting for, and could be a good reason to watch this film in and of itself.